Aloo gobi/ Potato cauliflower sabzi (dry curry) is a very popular North Indian dish.This dish is made with potatoes, cauliflower, ground tomato paste and ground fresh masala powder. Remove stalk of cauliflower. Wash and cut into pieces. Peel potatoes and cut into long pieces. Grind tomatoes, green chilli and ginger into a smooth paste. Keep aside. Grind peppercorns, black cardamom, cinnamon and cloves into a coarse powder. Keep it aside. Heat oil in a pan. Fry potato pieces in oil till they turn light brown in colour. Transfer to a plate and keep this aside. Heat oil in a pan. Add cumin seeds, asafoetida, green chili and ginger. Saute well. Now lower the flame and add chili powder, coriander powder, turmeric powder, ground coarse powder, and kasuri methi. Saute for a second. Add ground tomato-green chili-ginger paste to this. On medium flame, cook till the oil starts to float on surface. It will take about 10 minutes. Add 1/2 cup of water to this. Allow it to boil. Now add fried potato pieces, cauliflower pieces, coriander leaves. Close the lid. Cook for 2 minutes. Switch off the stove. Serve along with roti or naan. 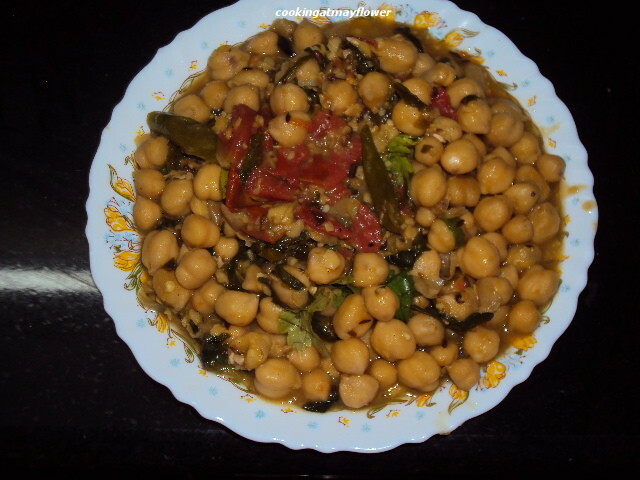 Three bean curry uses three types of beans like garbanzo beans, kidney beans and white beans. This is also a no onion-garlic recipe. The curry is prepared with cooked beans, ground tomato paste, freshly ground masala powder and coconut oil. Here you grind some beans to get a thick gravy. This curry pairs well with chapathis. Wash and soak chickpeas, kidney beans and white beans for 8 hours. In a pressure cooker, first cook chickpeas with salt for 4 whistles. Keep this aside. Pressure cook kidney beans and white beans with salt and water for 4 - 5 whistles. Keep this aside. Grind two big tomatoes to a fine paste. Keep aside. Grind half cup of cooked beans. Add 1/4 cup of water to the ground beans. Keep this bean paste side. Heat oil in a pan, splutter cumin seeds. Add crushed green chilli and ginger. Saute well. Add tomato puree and saute well on low flame for 10 minutes. When the water is all dried out and the gravy is thickened, add cooked beans with water. Mix well. Add ground masala powder, ground beans paste, and salt. Cook for another 5 minutes or until the curry becomes thick. Now turn off the stove. Pour 1 tsp of coconut oil over the curry. Sprinkle chopped coriander leaves. 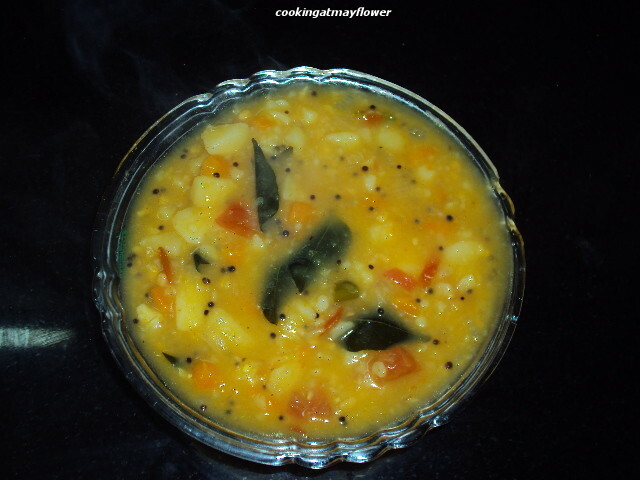 Serve hot with chapathi. Peel carrots and potatoes. Chop carrots and potatoes into pieces. Cook them with little water and salt. Mash them lightly. Heat oil in a pan, crackle mustard seeds and urad dal. Saute onions, green chillies, and curry leaves. When the onion starts to change colour, add tomatoes and allow them to get mashed up. Now add turmeric powder. Add some water to this. When the water starts to boil, add mashed carrots and potatoes. When it starts to thicken, switch off the stove. 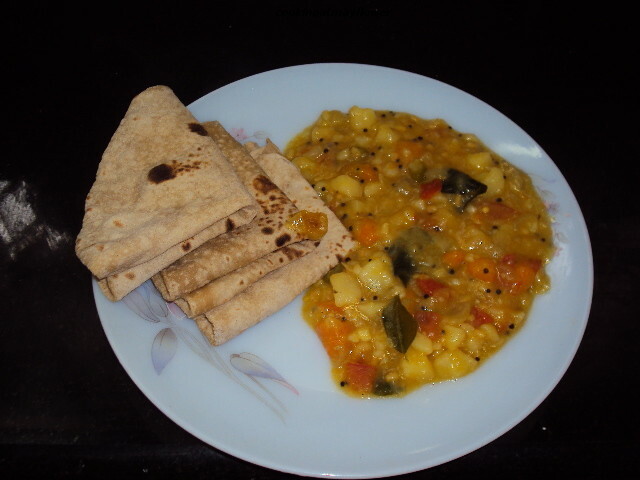 Serve hot with Chappathi, Pooris etc. Methi chole/ Fenugreek and chick peas curry. A protein rich delicious side dish that goes well with roti, bhatura, nan, poori, and even with plain basmati rice or jeera rice, ghee rice. Soak chickpeas overnight , pressure cook the next day . Wash methi leaves and take out the leaves from the stem .Dry roast the 3rd ingredients and grind. Heat oil in a pan splutter cumin seeds, fenugreek seeds, and cinnamon. When it turns light brown in colour, add green chillies and ginger saute for 2 minutes then add asdfoetida and methi leaves. Saute them well. When it is cooked well, add turmeric powder and salt . Now add chopped tomatoes to this . When tomatoes are cooked well, add chickpeas ( save 3 tbsp of chickpeas to mash). Add 1 cup of water and cook for 3-4 minutes. Cook for another 8-10 minutes in low heat. Now add mashed chickpeas and tamarind paste . Mix and cook well . Add the ground 3rd ingredients to this and when the gravy thickens. Decorate with coriander leaves. Serve with chapathis. Green chillies cut into small pieces - 4 nos. In a bowl, combine ivy gourd, crushed green chilly, grated coconut, crushed garlic and turmeric powder and salt. Mix well with your hands. Set aside this ivy gourd mixture. Heat oil in a pan. Add mustard seeds. When they start to splutter, add chopped onion and curry leaves. Fry for 1-2 minutes. Add the ivy gourd mixture and stir well. Sprinkle 2-3 tsp of water. Cover with a lid and cook for 6-7 minutes or until they turn dry. Open the lid and stir fry it for another 3-4 minutes. Serve hot.